The Toyota Liteace has been a well used and reliable vehicle for many years in New Zealand. Commonly used for deliveries for small businesses that carried light loads such as vegetables and fruit, flowers, food and other light products. The Toyota Liteace Cr40 and Cr30 is still very much in play and we get regular calls for people looking for the parts for these famous vehicles. 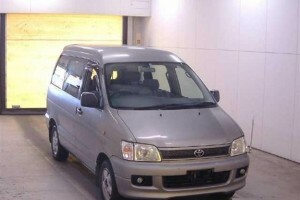 We also stock the Toyota Hiace Parts which is the big brother of the Toyota Liteace. The vehicles are popular with courier drivers and therefore run into the slight panel issue with a scrape or a ding here and there. We stock all the Toyota panels for the liteace and the hiace such as side panels, front bumpers, Toyota hiace sliding doors, toyota liteace sliding doors and all the tail lights and head lights. These Toyota parts are coming in and out of our Toyota wreckers yards here in Auckand every day. The 1997 models as shown below are very popular due to the economy of the diesel engine used. They are economical and very rugged with excellent room in the back for taller items . Favoured by painters and decorators due to the ability to get the ladders and safety ladders in the back with ease. Interestingly the Liteace vehicles in good condition still fetch good money as a second hand car. We do however import parts and wreck these cars on a regular basis. The headlights and tail lights for the vans are popular due to the amount of city work these cars get. Massive range of Toyota Liteace Parts just arrived at our store. Contact us now for the best price and instant delivery!